Thursday night truly begins only when I do my challah calculations and print out the week’s customized spreadsheet. I have spreadsheets like this set up for about 6 challah recipes and a few other breads (a sourdough cornbread, the chocolate sourdough I use for sufganiyot and a few more recipes that need scaling up or down at various times. Every week, it’s a new printout. I feel bad wasting the paper, but I feel like I have a clean new formula to work with. What I should do is just keep a copy of the recipe, scaled for x2, x3, x4 etc (x3 makes 5 challahs, plus a bit; that’s what I’m making this week). I have one hanging around from Rosh Hashanah that has something like x9 on it, and that was half what I ended up making, I think. Anyway, I do waste the paper, and it may not be normal, but it feels good to start fresh each week… so there. This is the basic “reliable challah” (eggless) that I make when somebody orders challah (I occasionally and VERY informally sell challah to friends in the neighbourhood…. if you live nearby and are interested). It always comes out the way it’s supposed to come out. I have scaled back the salt a bit based on comments, and it can come down a bit more from what’s shown here. My trick the last couple of weeks has been pre-fermenting the dough with a “yeasted autolyse.” Which basically means I dump in everything but the salt and all-purpose flour and let it sit as long as I want. Sounds simple? It totally is. Sitting for a while before the salt is added actually lets the flour begin the hard work of gluten development – completely untouched! This means that your dough will need less kneading when you finally DO add the rest of the flour and the salt. Most autolyse techniques call for just flour and water, no yeast, no nothing. But that’s just too many steps for me, and this one seems to produce a very tasty challah with almost no extra work. 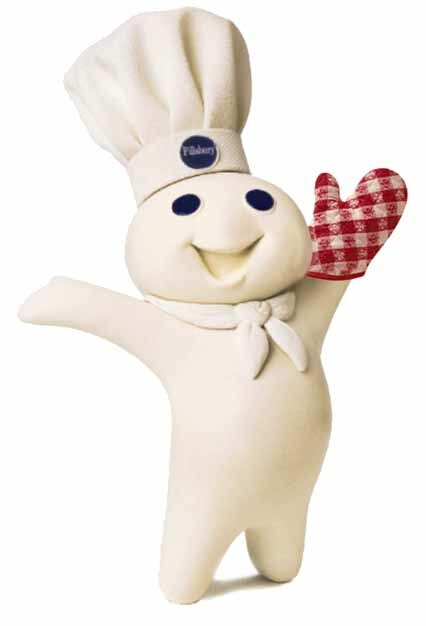 If you have time and want to play around, by all means, just throw the flour and water together alone first. But I like my way. And it’s definitely Thursday night now, and I’m tired. Maybe I’ll do try it the “right” way next week. What’s with all the POPPY -? My big culinary surprise in Israel: poppy seeds are everywhere, disguised, in baked goods. Now, I like poppy seeds plenty, in their place. I like them generously sprinkled on bagels, pletzel and challahs. I will even tolerate them in mango dressing and lemon cake. But I do not eat poppy-seed hamentaschen, and it is a very bad surprise indeed to bite into what you think is some sort of chocolate dessert bar, only to realize that the “chocolate” is poppy. Or, the next night, into a piece of “banana cake,” only to realize that the speckles are not banana, but poppy. 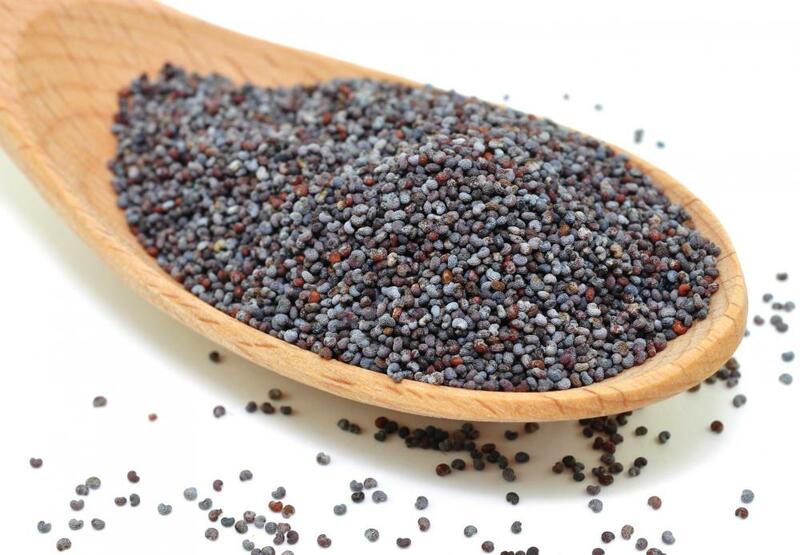 I think my issue is with dry, salty poppy seeds as a condiment (yum) vs wet, mushy poppy seeds as the main event (yuck!). Why are they so wildly popular over there, anyway??? I used my usual dough recipe from Second Helpings, Please (image below), though I don’t love it because it tends to misbehave in unpredictable ways. It has never come out the same way twice in twenty years (sigh, I feel so old saying that, but it’s true – the cookbook was a wedding present at my first wedding, and the children of that marriage are now far closer to 20 than to zero). This time, I did it in the food processor, where, of course, it totally jammed and made a sticky mess. Ultimately, I added a lot more flour than usual and they came out okay. It doesn’t taste like it usually does, but it worked. I always do one batch with a classic prune filling – or, as my baker sister likes to say, dried plums. It just sounds so much swankier that way. The filling was gooey going in, but actually firmed up nicely, as promised, once baked. However, I was not entirely delighted with these, because the baked filling tasted a bit too much like peanut butter. For all the (okay, small) effort I’d put in, I probably could have just used Skippy. Weird. For an encore, on the same theme, I decided to do a batch inspired by the oodles of delicious, soft, fresh marzipan (in Hebrew, “martzipan”) that’s found in every candy shop and grocery store. I had some yummy homemade almond paste in the freezer already (I use this recipe and freeze it in logs, instead of buying, because it’s WAY overpriced here!). Now, this was the same dough that I used for the prune and halva hamentaschen, and I promise, I pinched them shut just as well. Still… once you’ve got almond paste, you really can’t go wrong. Right? Open-faced hamentaschen – why the heck NOT? What are your hamentaschen variations this year??? Oh, yeah, and HAPPY PURIM!!! Posted from my new BlackBerry PlayBook (so many mixed-capital letters!) because it takes decent pictures and I can get them up here right away. Yay! 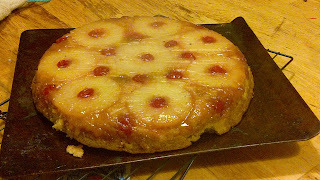 Here’s tomorrow night’s pineapple upside-down cake – a vintage classic. I admit, I have never loved pineapple anything, but we had the bottle of cherries sitting around,and the funky visual appeal of this cake is irresistible (indeed, I was moved to make this by a picture on a facebook friend’s profile). Haven’t tasted it yet, but the recipe is pasted at the bottom of this post if you’d like to try it yourself. 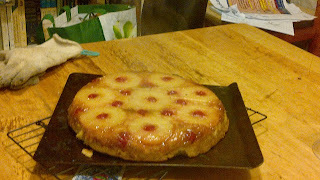 A big plus of this cake is that it’s “naturally” pareve, ie no messy recipe adaptations required. A big minus, in some folks’ opinion, is that the main “moistener” is mayonnaise… well, that and boiling water. If you can get past the idea that you’re eating mayonnaise cake, another plus is that you don’t need to add eggs. You can also try part-mayo and part-yogurt or sour cream or buttermilk if you want a dairy cake. Probably any of those would work fine to provide that “tangy” element. 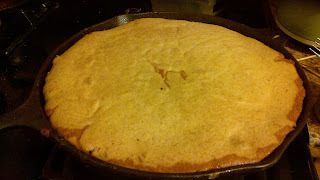 You can’t really tell here, but this is the cast-iron skillet before I poured the batter in. My pareve skillet (still pareve, despite an “issue” last week!!!) is 11” in diameter, and I’m glad I didn’t try this in a smaller pan. It was exactly the right size, no spills whatsoever. I know a good cast-iron pan is non-stick, but I stayed on the safe side and both sprayed and lined the skillet first! I spread a base of some leftover coconut-milk caramel aka dulce de leche I’ve been raving about, sprinkled with a bit of brown sugar. Then, I arranged the pineapples and cherries decoratively on top. Poured in the batter and baked about 40 minutes at 350 degrees. I was nervous about the “big flip”. When I tried it last week with cornbread, it turned out not to be baked enough and batter goobered out everywhere – not good. This time, I put the flat pan overtop of the skillet so the transition would be foolproof. No problem! Peeled off the parchment paper, and voila! Sift sugar, flour, soda, and salt twice (I pulsed the dry stuff well in the food processor). Mix in remaining ingredients (I mixed them in a separate bowl first, then pulsed them into the food processor until evenly mixed). Pour into greased 13 x 9 inch pan (I used my skillet). While baking prepare frosting. Melt 1 stick butter. Add 1 3/4 cup brown sugar, 1 1/2 cup coconut and milk to blend (1/4 cup or less). While cake is warm, spread frosting on top. 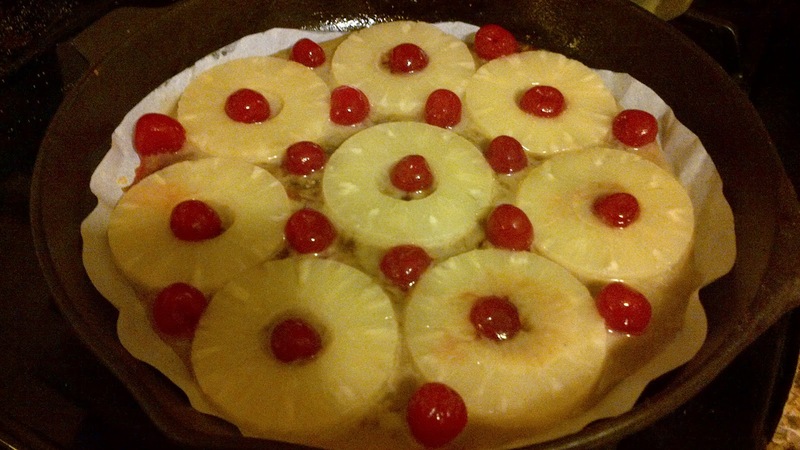 Place under broiler until bubbly and brown. There are 2 schools of thought when it comes to rogelach (well, besides the totally OTHER school of thought that pronounces them “rugelach” thus causing both mirth and confusion when discussing the vegetable called arugula)… where was I? Oh, yeah. 2 schools of thought: creamy or yeasty. Many recipes call for cream cheese, butter, etc. This gives a very nice, rich dough that is sometimes flaky, but is more “new world” than traditional, in my opinion. “Old world” is to make a pareve treat you can actually eat following a good meaty Shabbos meal. Like kokosh, blueberry buns, and many other yeasted delicacies from the Ashkenaz tradition, rugelach were probably invented as a way of either using up challah dough or saving the baalabuste (aka Hindy Homemaker) the trouble and expense of whipping up another dessert. As far as we know, my Bubby had ONE dough recipe that she used for absolutely anything that required yeast – it was her challah, her blueberry buns, her pletzlach (that’s the plural of pletzl!) and more. So when I’m stumped for a dessert, often I’ll turn to my challah dough, if I have extra sitting around, which I happened to this week, because even though I’m bringing challah to neighbours, I had a bit of extra dough in the bucket to begin with so there was plenty of dough to go around. That dough wasn’t sweet at all, but Auntie Sally’s challah recipe (doubled) calls for 2 whole cups of sugar (400g) so I figured I’d be just fine to make a dessert with the leftovers. I thought about cinnamon buns – I made some a couple of weeks ago using this EASY coconut-based dulce de leche (aka caramel sauce) as a base for the buns – and they were completely parvelicious. But I figured it was time for a change and a slightly new technique: rogelach. 2. Spread evenly with chocolate filling (recipe below). Oops… this wasn’t exactly a rectangle, and some of my triangles look pretty goofy. 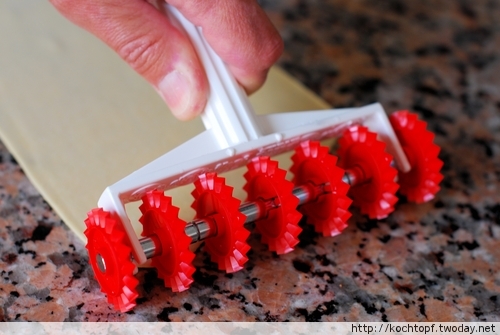 By the way, I used my ever-amazing Pasta Bike to slice. This is my model, which it looks like they’re not selling anymore. The current model looks more space-age, but it seems like it has most of the same flaws and perhaps a couple more. HOWEVER, I have never seen a tool that does what this does so well. All the criticisms on Amazon are true: the axel pops off from time to time, you can’t cut really narrow strips, the cutters are plastic. Nevertheless, especially since it came free with my pasta maker, I cannot really complain and would buy another in a heartbeat if something should happen to mine. 6. I baked mine at 350° for 20 minutes and then another 5 for good measure to get them nice and golden-brown, as seen above. Careful: depending on a whole bunch of factors, they may be tempted to burn on the bottom, so do not overbake. Found this recipe on the imamother forums when I was looking for something that remained more substantial than the cocoa / butter / sugar mixture I’d been improvising before (ie something that didn’t totally melt into a “memories of chocolatey” flavoured oblivion). Mix all dry ingredients. Add oil till you get a spreadable consistency (a mixer is very helpful but not necessary). Mixture keeps a long time in fridge; will thicken slightly, but will still be spreadable.